As I was breaking camp, something was bothering me: I drove a long way to eat barbecue on a barbecue trail. How could I leave without eating at all of the pits? So I typed in the address for the pit we missed the day before. After an hour of backtracking, we arrived at B’s Barbecue in Greenville. The first thing I noticed was that a road was named after the pit. As in a sign for “B’s Barbeque Rd”. The next thing I noticed was the walk up window at the side of an almost dilapitated building. I ended up going inside to order so I didn’t block the window. I was amazed at the number of people that came for barbecue so early in the morning since I’ve always thought of it as a meal for lunch or dinner. But when in Rome…Any doubts I had about the food or the fact that I went so far out of my way were quickly dispelled. The sandwich I had was incredible. The pork was moist and the sauce was a suggestion. The perfect balance of meat and smoke and sauce. 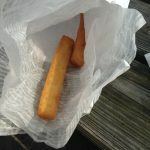 Instead of hushpuppies, I had corn sticks. I’m guessing it’s the same idea as a hushpuppy but so different. With a large cup of sweet tea in hand, back into the car. Corn sticks from B’s Barbecue. I had this bizarre sense of deja vu as we headed back the way we had come on the way to Grady’s B.B.Q. outside of Dudley. Even though it seemed like it was in the middle of nowhere, the line at the counter almost reached the door. As I waited, I signed the visitor’s book, noticing that I was the only person from out of country for a few pages. I ordered the plate: chop (chopped barbecue pork), coleslaw, and hushpuppies. I noticed a slight change in the taste of the meat: the smoke was slightly stronger and the sauce was a bit deeper tasting. The hushpuppies were crisp and light. When I stepped back inside to tell them how much I enjoyed the food, there was a slight lull in the crowd and I had a chance to actually talk to the people behind the counter. They made sure that I had signed the book and I had pens and cards handed to me before another rush of hungry mouths arrived. 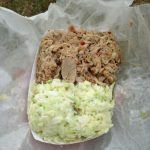 The plate from Grady’s Bar-B-Q: coleslaw and pork. Hushpuppies are around here somewhere. Hushpuppies from Grady’s. Piper was keeping an eye on them. In less than two hours, we rolled up to Stephenson’s Bar-B-Q in Willow Springs. I walked in the door to find some of the staff having a heated discussion which had started when a customer called all Southerners dumb. Knowing that my accent would give me away as an outsider, I quickly jumped in on the trash talk to become one with the local pack, like in a nature documentary. After laughs were exchanged all around, I soon left with my plate of chop and chicken, coleslaw, and apple sauce. I needed something that resembled a fruit in some form. The pork was good, the chicken tasty, the coleslaw wasn’t as acidic as some others, and the apple sauce as least gave the illusion of healthy eating. The flavour that I had noticed at Grady’s was a bit more pronounced here in that the smoke was a bit stronger and the vinegar of the sauce a little less prevalent. The plate from Stephenson’s Bar-B-Q: chop pork, chicken, coleslaw, and apple sauce. 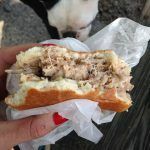 With a full stomach, I started the drive for the next pit and it seemed as though no time had passed before I arrived at Allen & Son Barbecue in Chapel Hill. I took a deep breath as I walked inside and steeled myself for the upcoming meal. However, I was quickly distracted when I looked in the kitchen and saw the side of the fridge was littered with photos of boxers. 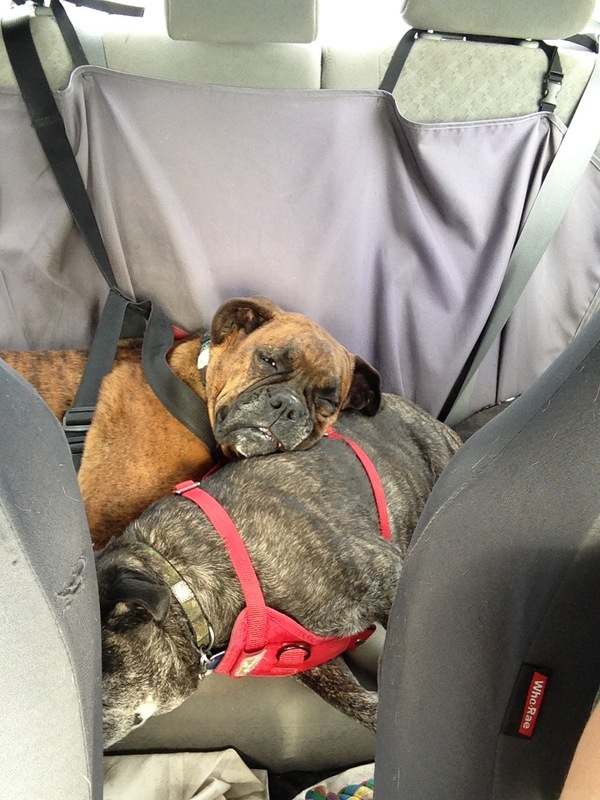 Well few bonds are as instant as the bond of breed owners. I was soon sitting at a table outside with a plate of chop, coleslaw, hushpuppies, and stew. Again the deep flavour of the chop; even without anyone telling me, I was beginning to taste the change across the trail. The stew was fantastic. 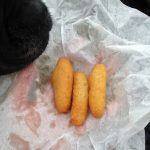 And the hushpuppies had become round and there was a hint of something other than corn. 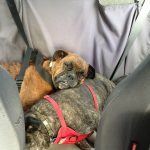 Soon the woman working behind the counter came outside with a carafe of water and to snuggle with the dogs. The table outside was a nice place to sit and we took our time eating before we left. 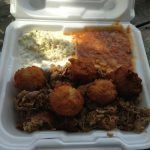 The plate from Allen & Son Barbecue: chop pork, hushpuppies, stew, and coleslaw. Leo looking for any tidbits. Next stop: Hursey’s Bar-B-Q in Burlington. And now here is where I started to get clever: when I walked up to the counter and gave my little speech about being there for the barbecue, I then asked if they had a kid’s meal. And here they do, sort of. I ordered the hotdog without the bun. Even though there was no hotdog; it’s just chop in a hotdog bun. So a little bit of chop, some hushpuppies, and fries for a change. 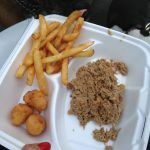 The hushpuppies were light, the fries crispy, and the pork tasty with just enough sauce to keep the meat moist. I very rarely had to add any additional sauce on the whole trip as they seemed to know just how much was needed. We had time for one last stop, which is good because it was less than an hour away. Final pit of the day was Stamey’s Barbecue in Greensboro. Of all the places we had been to thus far, I’d say it was the nicest building. Considering that it was across the street from the Greensboro Coliseum that’s not surprising. I had my first taste of red slaw which is coleslaw with barbecue sauce. Mixed with the chop it was an incredible compliment. Last stop of the day at Stamey’s: red slaw and chop. By this point, it was time to start thinking about where we were going to spend the night. The weather forecast was calling for rain and thunderstorms in the morning so camping was out. Thankfully there was a Red Roof Inn nearby and I was able to drag myself up to our room. When I walked inside I would have whistled if I could have (I can’t whistle). 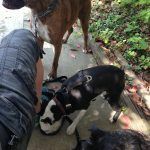 It was so much nicer than I expected that I felt almost pampered as I climbed into bed with the dogs soon snoring around me. 1 response to "The Road to Q-Demption – Day 3"